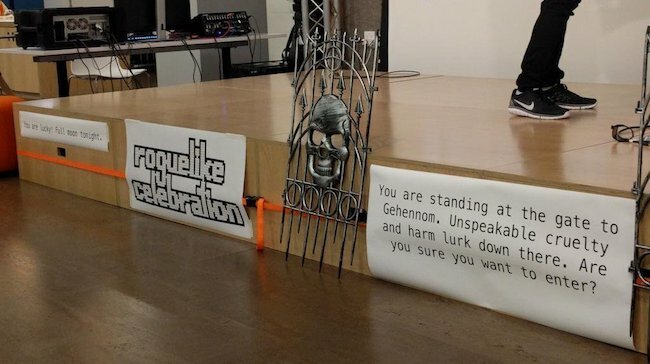 Articles, swag, decorations, and tweets from the Roguelike Celebration on September 17, 2016. 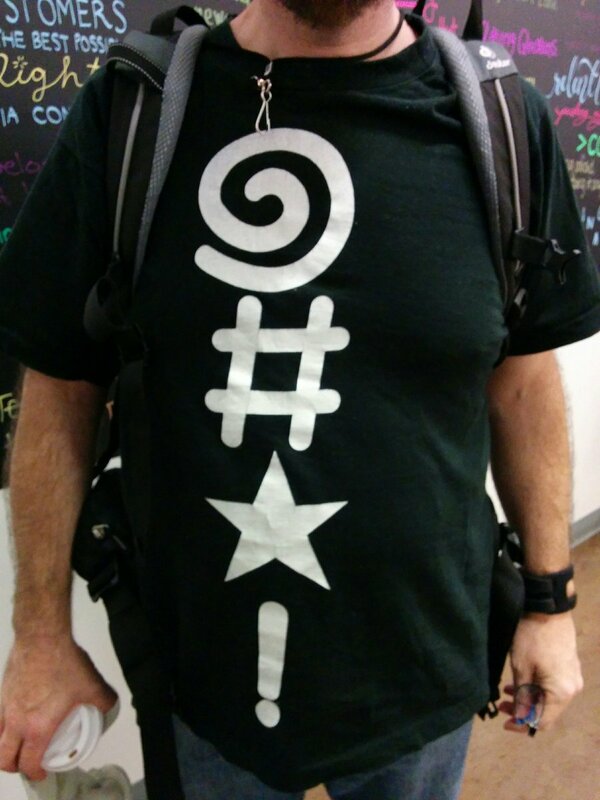 Tweet archive: #roguelikecel. Instagram photos. 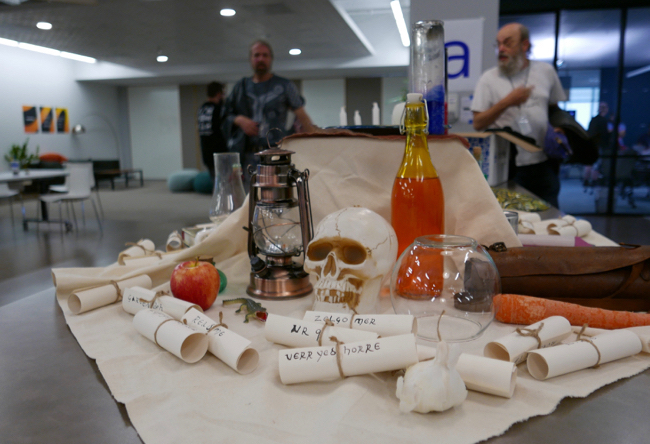 Before the main event in September, we held a free roguelike meetup on May 17, 2016 in SF. Videos from the 2016 event are on the Internet Archive and YouTube. Tony Carnevale, Kotaku: "Rogue Creator Says We Need A Better Word For Permadeath"
Josh Ge, speaker: "Roguelike Celebration 2016, the Experience"
Mark Gritter, attendee: "Roguelike Celebration notes 1/N", "Roguelike Celebration 2/3", "Roguelike Celebration notes 3/3"
Justin Hamilton, attendee: "Roguelike Celebration 2016"
Alex Handy, Software Development Times: "SD Times Blog: The story of Roguelikes and ASCII"
John Harris, speaker: "Roguelike Celebration, Notes on My Talk"
Santiago Zapata, speaker: "Roguelike Celebration 2016 San Francisco"
Alex Zelenskiy, attendee: "Roguelike Celebration Recap"
Just for fun, we designed badges, pins, t-shirts, and socks for all attendees, along with special t-shirts and challenge coins for speakers. We got to make roguelike fan merchandise! Badges (and nail art) designed by Danielle Baskin. 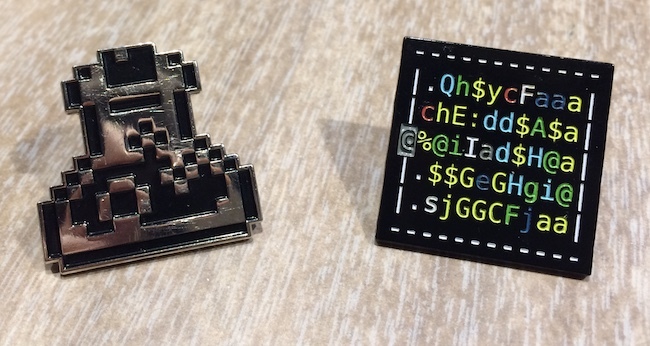 Pixelly potion pin designed by Amanda Glosson, and Nethack treasure zoo pin designed by Noah Swartz. 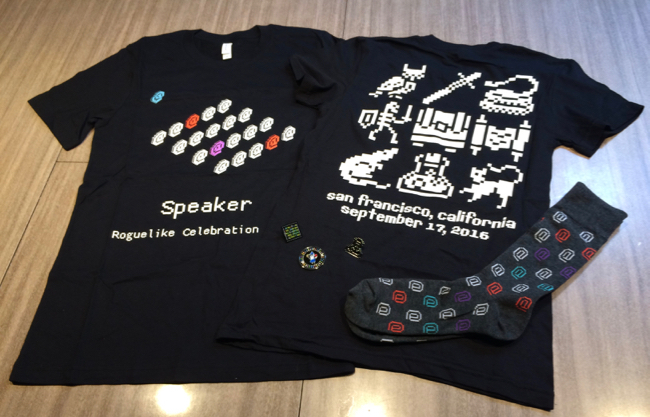 Speaker t-shirt designed by Allison Hughes (an audience listening to a speaker), attendee t-shirt designed by Amanda Glosson (with pixelly dungeon creatures and items), and @ symbol socks designed by Allison Hughes. If you want to make custom socks, Sock Fancy does a great job. 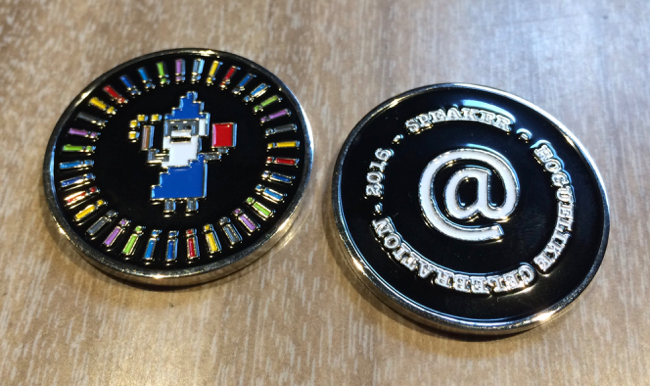 Challenge coin for speakers (a wizard with a wand and spellbook, surrounded by potions), designed by Allison Hughes. We thought it'd be nice to give speakers a little memento they can display. 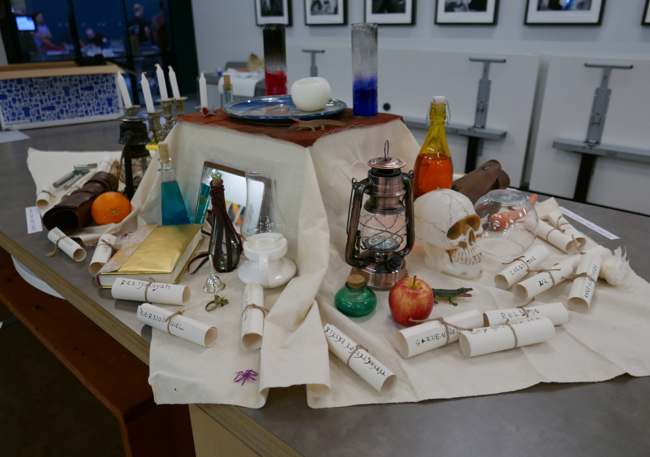 We had a table with an altar, potions, unidentified scrolls, oil lamps, comestibles, bones, a candlelabrum with candles, a silver bell, a crystal ball, lizards, leather armor, a wooden flute, amulets, rings, spellbooks, a mirror, tins, a tin opener, and other items from Nethack. We put up posters with quotes and monsters from Nethack. Eventbrite generously donated use of their office space as the venue — thank you to them and their staff. DigitalOcean generously supported this celebration. People wrote lots of nice tweets with quotes and photos. Here are a few of them! 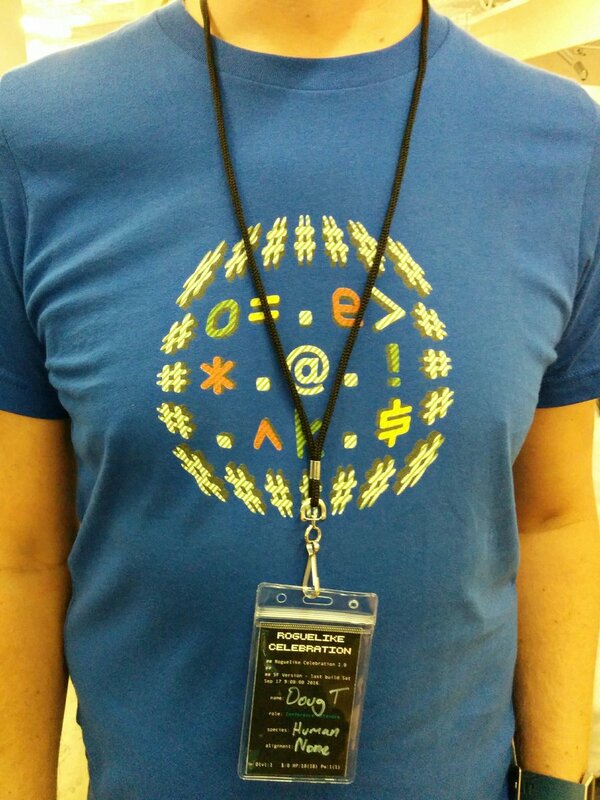 #roguelikecel is a combination of systems design and computational Oulipo conference. Brain already overloaded and we're just hitting lunch. #roguelikecel was awesome and inspiring as a designer. Walked away with a bunch more takeaways for Magic than I had expected. 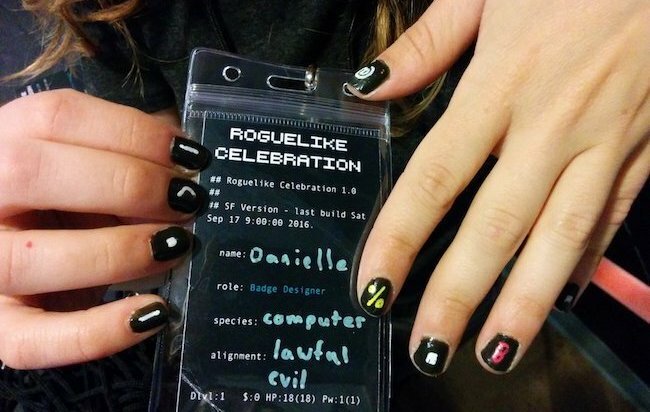 #roguelikecel was a totally mind-blowing experience. As close to perfection as possible. I need to cover that in an extensive blog post. Bad News is an installation-based game that combines procedural generation, deep simulation, and live performance. It's created and run by a team from the University of California, Santa Cruz. Kick-off in the cafeteria with Noah Swartz. Track 1 Dungeon Hacks with David Craddock. To the uninitiated, roguelikes appear simple: text blips denoting monsters and legendary heroes prowl through dungeons hewn from hash signs and periods. Under the hood, these games abound with clever algorithms that ensure no two adventures will ever be the same. Dungeon Hacks author David L. Craddock plumbs depths of 10,000 feet to discuss the history of the genre—from primordial titles like Beneath Apple Manor and Rogue to contemporary classics such as NetHack and Angband, and the foundational tropes that inspire the roguelike authors of today. David L. Craddock is the author of several books on game development including Dungeon Hacks, Stay Awhile and Listen, and Break Out: How the Apple II Launched the PC Gaming Revolution. Additionally, he is the author of Heritage, a fantasy novel for young adults named runner-up of the Shortlist for Speculative Fiction Book of the Year (2014) – Book Publishers Association of Alberta. 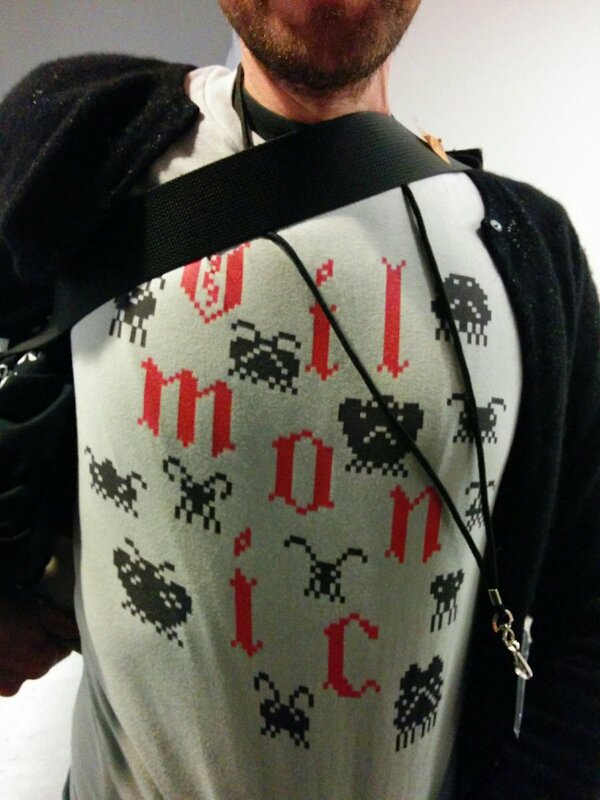 Track 2 Love Letter to Nethack with George Moromisato. George Moromisato will talk about his love for Nethack and how adapting its mechanics to his game, Transcendence, taught him more about game design than any course or book. Along the way he’ll speculate on what makes Nethack (and other Roguelikes) so special, and what makes them so much deeper and engaging than many big budget games. George Moromisato is an American software engineer and game designer. He’s been programming for 70% of his life and has worked at Microsoft, IBM, and Lotus Development Corporation. He is the creator of several computer games, including Anacreon (one of the first 4X games), Chron X (the first online collectible card game), and most recently, Transcendence. You can reach him via email (gpm@kronosaur.com) or Twitter (@Transcendence). Track 1 Rogue panel with Ken Arnold, Michael Toy, and Glenn Wichman. The three original creators of Rogue will have a panel discussion about rogue and its history, moderated by David Craddock. They will discuss the game's development and their process as well as its legacy, before opening the floor for questions from the audience. Track 2 Accessibility with Alexei Pepers. This talk examines how features of the roguelike genre relate to accessibility for visually impaired players, using Nethack as a case study. Several changes were made to Nethack to make it more accessible, and the feedback from this case study provides several lessons as to how roguelike games in general can be made more accessible, as well as what aspects of them pose the biggest challenges to accessibility. Alexei Pepers is a graduate of the University of Calgary, who is now working as a programmer in the games industry at Beamdog. She has loved Nethack since childhood and always wanted to know how it ticked, so in the final year of her degree conducted a research project on introducing accessibility for visually impaired players to Nethack, under the supervision of Dr. John Aycock. John Aycock is an associate professor at the University of Calgary, and the author of Retrogame Archeology: Exploring Old Computer Games. Enjoy our dedicated quiet room (the library), socialize with speakers and attendees, or just relax. Track 1 Concrete Poems with Nick Montfort. Levels of Rogue are virtual spaces, but also typographical grids that relate to a 1st century Latin word square, typewriters from the 19th century, concrete poetry and visual art in the 20th century, and preceding computer games. By considering the history of monospace type, character sets, and the visual arrangement of punctuation and letters, along with the ways language has been inscribed by hand, by machine, and digitally, it's possible to see new genealogies for roguelikes and new contributions these games have made. Nick Montfort works in creative computing, particularly as it relates to language and text. He develops computational art and poetry, often collaboratively. He studies video and computer games, popular and obfuscated programming, digital poetry and other electronic literature, demoscene productions, and aspects of computing that are less easily classified. He is professor of digital media at MIT and lives in New York and Boston. Track 2 DCSS (Dungeon Crawl: Stone Soup) with Nicholas Feinberg. The eternal war against the Hypothetical Optimal Player: how to avoid players' worst instincts and make a game that's fun to play well. Nicholas Feinberg is an obscure independent game developer (best known for Manufactoria), Nicholas joined the Stone Soup team in early 2014. He's since become one of the most active developers. Likes: elegant, minimalist designs, non-traditional settings, and long walks on the beach. Track 1 Kingdom of Loathing with Zack Johnson. Beyond the Mad Lib (But Just Barely): an oral history of the ways in which Kingdom of Loathing uses procedural text generation for flavor and humor. Zack Johnson is the creator of the long-running web MMORPG Kingdom of Loathing and its upcoming cowboy spinoff West of Loathing. If prompted (or intoxicated) he will speak at length on the virtues of HTML frames. Track 2 Angband with Erik Osheim and Robert Au. Alter Reality: Erik Osheim and Robert Au will talk about the evolution of Angband over the last ten years of development. Starting with the unofficial release of 3.0.7s, this will include the creation of a dev team, the successful effort to relicense Angband, and the sometimes controversial efforts to continue to develop and improve Angband. The talk will focus on Angband’s game mechanics as well as the principles and development practices that keep the project going. Take 90 minutes to stretch your legs and enjoy neighborhood lunch options. We recommend this Yelp search of lunch places within four blocks that are open for lunch on Saturdays. You'll find fancy pizza places, tasty Vietnamese food, a beautiful tea lounge, bars, and sandwich shops. Track 1 Difficulty in random games with John Harris. John Harris is the author of @Play, a column about roguelike games. Track 2 Tone and humor in Dungeonmans with Jim Shepard. Surface-dusting Storytelling: Humor and Fiction in Dungeonmans. Roguelike players enjoy building their own fiction around the adventures of their hero, and this is usually encouraged by the ridiculous specifics and wild build customization available in most roguelikes. There's a spectrum between a blank canvas world where everything centers on the travels of your murderhobo, and a highly detailed world with concrete fiction such as Qud. Jim will talk about how you can bring more of their setting's ideas to life without having to dive too deeply into a fiction, as well as how to apply humor with enough subtlety as to not beat players over the head with it. Track 1 Dwarf Fortress Design Inspirations with Tarn and Zach Adams. The creators of Dwarf Fortress discuss the influence of several roguelikes on the foundation and continued development of the project. Tarn and Zach Adams are the co-founders of Bay 12 Games. Their main project is Dwarf Fortress, a fantasy simulation game which is distributed free of charge and has developed a strong niche following. While centered around a dwarven colony mode, the game's adventure mode is a traditional roguelike roleplaying game. Track 2 Get your game done: experiences through the development of 13 roguelikes with Santiago Zapata. Get your game done: Experiences through the development of 13 roguelikes. Santiago Zapata (also known as Slash) has been messing around with roguelikes for about 15 years. Creator of roguebasin, roguetemple, and many not-so-famous roguelikes, he enjoys pushing the boundaries of the roguelike genre to create new gameplay experiences, while keeping the spirit of the originals. Track 1 Cogmind and becoming a developer with Josh Ge. From Hobbyist to Full-time Roguelike Developer. Tracing my route from before I even knew what a roguelike was to years of exploring the genre and community before setting out to create a grand and innovative roguelike with just the right mix of traditional and modern features to help guide the genre towards a more mainstream audience without losing anything that makes roguelikes great. For the past three and a half years, Josh Ge (aka Kyzrati) has been working on Cogmind, a sci-fi robot-building roguelike with a focus on audiovisual immersion and a combination of procedural and handmade content. Josh has spent years helping other developers in the community, writing articles about building roguelikes, and also created REXPaint, a widely-used ASCII art and roguelike development tool. Track 2 Practical Low-Effort PCG: Tracery and data-oriented PCG authoring with Kate Compton. Procedurally generated content is great, but writing so much custom code becomes unwieldy and too many great projects die tangled-up in long chains of if-statements. Tracery, a popular and newbie-friendly generation tool, can keep data for procedural content generation separate from the gameplay code, while still generating neat stuff. The creator of Tracery demos a few neat tricks (no-hassle reskinning of RPGs and more!) and shows some hard-earned lessons for how keeping your data and code separate can make projects clean, maintainable, and fun to build. Kate Compton is a long-time Procedural Content Generation (PCG) practitioner. She wrote the first paper on procedural platformer levels, generated the planets for Spore, and wrote the latest SimCity fire system. She is now a PhD candidate at UC Santa Cruz developing artificial intelligence to augment human creativity with generative art. She likes laser cutting, 3D printing, artbots, twitterbots, and baking. Track 1 24 Years of ADOM in 24 Minutes with Thomas Biskup. Thomas Biskup has been the ADOM developer and maintainer for over 20 years. Besides spending time on ADOM he is a computer scientist, founder of QuinScape GmbH, a German IT service company, published RPG designer and general nerd and geek. And between all that he even managed to finish his Ph.D. (but he only insists on being called Doctor if you annoyed him or he is annoyed of you ;-) ). He is proud to have been there at the dawn of time when the Internet as we know it nowadays evolved and notices that he's getting old when he starts mumbling about "the great olde times of yore". Track 2 Markov by Candelight with Jason Grinblat. Markov text generators are hilarious, poetic, and surprisingly creative. But they haven't found much of a home in games. In this talk, Jason Grinblat teaches you to build your own Markov text generator. He then walks through a design experiment in which he uses Markov text to procedurally generate in-game lore books for his roguelike/RPG, Caves of Qud. He explains how he moves beyond "just a generator" and weaves a game mechanic around the text generation: players can research generated books at an in-game library and learn meaningful secrets that they can act upon in the game world. Jason Grinblat is co-founder, designer, writer, and gameplay programmer for Freehold Games, the tiny studio behind Sproggiwood and Caves of Qud. Their mission is to build imaginative games that involve offbeat settings, interesting tactical situations, and a whole lot of emergence in the tradition of the roguelike genre. Track 1 Servers and NAO with Drew Streib. Drew is the owner of nethack.alt.org, the host of nethackwiki.com, and the author of dgamelaunch (the frontend for most public Nethack and Nethack variant servers these days). He will talk about the role of public servers for roguelikes and will field questions about NAO. Track 2 Proc gen and gameplay with Brian Walker. The creator of Brogue will talk about emergent storytelling in roguelikes. How can each play of a procedurally generated game feel distinct and memorable to a veteran player? And how can a single player game reward both skill and creativity? Brian will discuss specific gameplay elements and game design techniques to maximize the number of unique player experiences per unit of game content. Brian Walker grew up playing the original Rogue. He taught himself to code by developing Brogue to be the roguelike that he always wanted to play. Five-minute talks covering any topic that an attendee wants to talk about. In the words of the Bad News team: "The third installation of Bad News was at the Roguelike Celebration in San Francisco. For the first time, we conducted a live playthrough in front of an audience. This was done in in the style of a radio play: gameplay still took place in an isolated room, but the audio was piped into an auditorium where the wizard also performed live, with his interface projected onto a large screen; additionally, the guide provided narration about behind-the-scenes activities. Trivia: Both Rogue and Bad News originated at the University of California, Santa Cruz." Track 3 Procedural generation in Voyageur (recorded) with Bruno Dias. Voyageur is an upcoming literary RPG about exploring a galaxy full of distinctive cultures and ideologies. This is a 20-minute talk about how Voyageur uses prose generation to create evocative descriptions of procedurally-generated places. Bruno Dias is a game developer, IF author, writer, and theorist based in São Paulo, Brazil. His nonfiction writing has appeared on Giant Bomb, Zam, and ZEAL; currently, he's working on Voyageur, a literary science fiction game about one-way space travel. Track 1 Show and Tell. Bring a laptop with your favorite game on it and show it off to other participants! Perhaps try a game you haven't tried before, with the option of help from experienced players when you get stuck (or offer to help others). Plus: wiki editing time, collaboratively updating articles on Wikipedia and other popular wikis, such as NetHackWiki, Crawl Wiki, and RogueBasin. Event ends. Hard stop at 7:00.